Population (1 Jan 2003): 132.493; area: 91,27 km². Settlements: 's-Hertogenbosch (seat), Bokhoven, Empel, Engelen, Hintham, Kruisstraat, Meerwijk, Orthen, Rosmalen. When the present municipality of 's-Hertogenbosch was formed on 1 Jan 1996 by the merger of the former municipalities of Rosmalen, and 's-Hertogenbosch it was decided to adopt a new flag. On 23 Sep 1999 the new flag was adopted by municipal resolution. Description: five equally wide horizontal stripes of red and white. In the canton a yellow "Bosboom" (bush-tree) on black. The five stripes symbolize the five former municipalities (Bokhoven (1922 part of Engelen), Engelen (1971 part of 's-Hertogenbosch) Empel en Meerwijk (idem, 1971), 's-Hertogenbosch, and Rosmalen (part of Den Bosch 1999); the number of branches of the tree do as well. The colors red and white were the colors of the arms of the former quarterly division of Maasland, to which Empel en Meerwijk, and Rosmalen belonged. 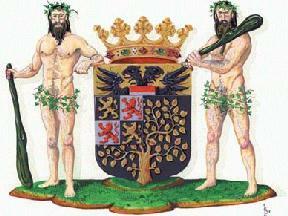 The tree relates to the Coat of Arms of Den Bosch and symbolizes ancient values like authority, freedom, growth, and law (place where law is administered). Source: the 's-Hertogenbosch municipal website. Note that the official name is 's-Hertogenbosch. Den Bosch is the popular name. The name in French is Bois-le-Duc. Why the hell do you use such a complicated name whereas the French equivalent Bois-le-Duc would be so simple and elegant? Tour de France 1994 started in Den Bosch. Several French reporters definitively puzzled by the weird 's called the city "Saint. Hertogenbosch", which might therefore be elected patron saint of the illiterate reporters :-). The coloured ribbon used to tie giftwrapped parcels is called in French "bolduc", from Bois-le-Duc, where this product was manufactured in the past. The Guide Vert Michelin Hollande says that Den Bosch was granted city rights by Hendrik I of Brabant in 1185. In 1561, Philip II of Spain, then ruling the Low Countries, made of Den Bosch a bishopric depending on the archbishopric of Mechelen. In 1579, the city took the Spanish party and surrendered to Frederik-Hendrik, Prince of Orange, only in 1629, after a long siege. In 1794, the city was seized by the French general Pichegru after a 18-day siege, and became, as Bois-le-Duc, the capital city of the department of Bouches-du-Rhin. Den Bosch is the birth city of Hieronymus van Aken (c. 1450-1516), better known as the painter Hieronymus (Jeroen) Bosch. Flagdescription: Seven equally wide horizontal stripes of red and white, with in the canton a black square, with a height of four horizontal stripes, on which a yellow leaved tree. This flag was in use since 1957 after a design by laborers of the municipality. The yellow tree on black is the factual municipal symbol, as used since the first half of the 13th century. The red and white stripes, also found in the municipal arms, remind of the Habsburgers, who gained a stable position in the Netherlands by the presence of Maximilian in 1482. On 4 Apr 1857 the "commissaris des konings" (provincial governor) of Noord-Brabant wrote to the minister of Home Affairs, that the "municipal flag of 's-Hertogenbosch was a flag of two equally wide horizontal stripes in red and white, with in the center the complete municipal arms. from the 's-Hertogenbosch municipal website. The quarters with the Limburg arms showed the red lion on a field of gold (instead of silver), the lion uncrowned (instead of crowned) and singletailed (instead od doubletailed). See Ralf Hartemink's page about 's-Hertogenbosch. Flagdescription: two equally wide horizontal stripes of yellow and black, with in the canton two equally wide horizontal stripes of red and white. Adopted by municipal resolution on 26 Oct 1989. Description occasional banner of 1935 (750 years of existence of Den Bosch): chequy with red and white blocks and a square with the municipal arms of 's-Hertogenbosch. For the flight of steps of the city council-house these two banners of arms were made (Brabant and Den Bosch). These were still in use in 1947 and 1955. At the homage of all North-Brabant mayors to the celebrating city in July 1935, there was such a flag with the respective municipal arms in the canton for each municipality. Afterwards they were given to each mayer to take with them. In several municipalities they were later used as (unofficial) municipal flag. In one case (the former municipality of Den Dungen, the flag was later adopted officially (in 2:3 form).